PDA members have produced a charter of seven commitments to improve safety and care for patients, through better working conditions in UK pharmacy practice. Keeping patients safe is key to the role of every pharmacist. But less than safe working conditions risk harm to patients as well as damaging consequences for pharmacists – such as impacting on their physical or mental health. through better working conditions in UK pharmacy practice. This charter defines basic standards to ensure safe practice wherever pharmacists work. The commitments in the charter should be standard practice whenever and wherever pharmacy work is carried out. 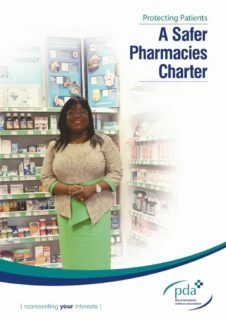 We actively encourage other interested parties to endorse the charter and those who own or manage pharmacies to adopt the charter and ensure the commitments are fulfilled in their pharmacies. Pharmacists - Add your voice to the campaign for Safer Pharmacies. PDA Union members have alerted us that Well Pharmacy have inadvertently emailed out a spreadsheet containing data about pharmacists, in a significant data breach. The spreadsheet was attached to an email titled “Xmas Payments” and was sent last week to locum pharmacists. The PDA does not know how many people received the information. PDA Union members care about patients, the National Health Service and healthcare in the UK overall and that’s why the PDA Union are working with Health Campaigns Together (HCT). The PDA were delighted to be a sponsor at the 8th annual RPS Wales Medicines Safety conference, which saw expert speakers from different sectors of practice come together on a subject which unites the profession perhaps more than any other - patient safety. The campaign to get pharmacies across the UK to meet the seven commitments to improve safety and care for patients, through better working conditions in UK pharmacy practice is continuing. Here are some of the latest developments in support for the PDA’s Safer Pharmacies Charter. PDA Executive Representative for Wales and West England, Richard Evans represented the PDA at the Plaid Cymru Conference Dinner on Friday 5th October in Cardigan, Wales. Community pharmacies across Wales will soon receive a copy of the Safer Pharmacies Charter. The document, produced by the PDA (Pharmacists’ Defence Association), outlines seven commitments to improve safety and care for patients, through better working conditions in UK pharmacy practice. The Pharmacists Defence Association (PDA) has released survey results that show seven basic standards of pharmacy safety are regularly not being met and is demanding action to protect patients, pharmacists and the tax payer. The world of pharmacy in the UK includes a number of organisations that influence how the profession works. The PDA are proud to be the independent trade union for pharmacists and to play our part, but for the system to work best we also need the other organisations to be effective and contribute appropriately.